We invite you to slow down and take a step back in time. Come see, touch and taste the charm of years gone by in our grand turn of the century building. Take a stroll through 5 historic shops that include Orillia’s most celebrated bakeshop, a quaint café, a fudge & candy shop, a home decorating store, and a shop for handmade soaps & candles. 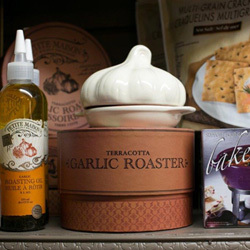 You’ll discover a storefull of unique fine food products just like your Great Grandma used to make. Family owned and operated, the Mariposa Market will carry you back to the main street general store of yesteryear. We invite you to sample a slice of small town Ontario preserved for you to enjoy. Come savour the aroma of cinnamon buns warm out of the oven. Taste truffle laced tortes just dripping with chocolate dipped strawberries, homemade chocolate chunk cookies and éclairs stuffed full with real whip cream. 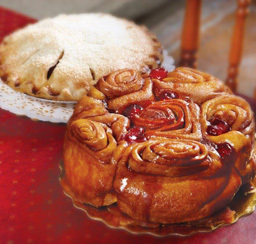 The Mariposa Market bakers create a breathtaking array of handmade pastries, cakes, pies and breads each and every day. From our Cranberry Walnut Bread, our chunky homemade apple fritters, our famous Skor Cake, and our gooey Apple Pecan Chelseas, the bakery alone is worth the trip. 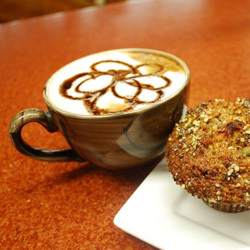 Come discover why the Mariposa Market Café is Orillia’s favourite place to meet family and friends. We invite you to pull up a chair and tuck into a turkey and stuffing sandwich with homemade sweet pepper jelly, or perhaps our signature California salad heaping with fresh strawberries and grapes. From buttery croissants and homemade meat pies, to steamy cocoa positively brimming with marshmallows, the Mariposa Market Café is known far and wide for incredible food and selection. And no visit is complete without sampling one of our famous Texas Donuts smothered in fudge icing! Our Seasons Shop truly changes with Mother Nature. In the Springtime it’s a walk in the garden with whimsical stepping stones and hand painted bird houses. Come Summer, it’s a day by the lake with gifts for the cottage, and everything to make the perfect family picnic. In the Fall, the Seasons Shop comes alive with colour, cranberry pumpkin spice kitchen candles and heart warming throws. Then, with the arrival of Winter, the Seasons Shop celebrates the magic of Christmas past with decorating ideas to turn your home into a winter wonderland. From exquisite toiletries by Crabtree & Evelyn and environmentally friendly soaps and scrubs from the Rocky Mountain Soap Company, to the latest purses from Guess, we invite you to indulge your senses in the Scent Shop. 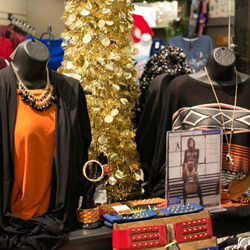 Unique jewelry, snuggly cotton nightwear and beautiful Canadian made clothes and accessories – the Scent Shop is literally a store full of small treasures. Take a step back in time and explore our Victorian themed shop for ladies and treat yourself to something nice.